“The Avengers,” “Captain America,” “The Hulk,” “Iron Man,” “Thor.” Try to name a superhero movie that doesn’t follow the same basic three-act structure—setup, confrontation and resolution. The first third shares the background on the main protagonist, establishes relationships and contains an inciting incident to push their lives off path. The middle section is full of action as the protagonist desperately attempts to fix the problem raised in the previous act, but fails due to lack of skills. The final third of the film contains the climax (long awaited battle) leaving the protagonist feeling accomplished, with a better sense of self-worth. The same structure is implemented in “Doctor Strange,” Marvel’s latest instalment. However, it still manages to be one of the best superhero movies in years. The tale of hubris, pathetic pride, and unavoidable downfall relates back to the original tales of man. And a sparkling cast, experimental director (Scott Derrickson) and visually stunning CGI has created a film much more original than anything Marvel has released in the last decade. The cast hold their own as reality continually shifts. Rachel Mc Adams (“Meangirls”) accompanies Cumberbatch as his theatre nurse and love interest. Benedict Wong (“Marco Polo”) adds brilliant wry humour to the cast as a librarian to the ancient spells books. And finally, the most important character of all, Doctor Strange’s feisty trademark cloak takes on its own agendas. Together, they keep the narcissistic high-achiever in his place, and help to lighten his generic beats of arrogance. The solid performances anchor the plot during the trippy visual layers. The space-and-time distorted mirror-realities are phenomenal, similar to the bending dream city in “Inception,” but much more enchanting. But the triumph of this movie is not the dizzying effects or kaleidoscope action sequences. The triumph is how the creative premise and appealing plot hides the Marvel Cinematic Universe. Benedict Wong reveals that their craft is but a cosmic component at work with the Avengers to protect the earth against malevolent visitors. This is the only occasion where the team are mentioned, giving “Doctor Strange” some much deserved independence, and expanding on Marvel’s narrative web. The parallel dimensions, spells and time loops may sound complicated, but Derrickson chooses action over exposition. The best of “Harry Potter” and “Inception” are merged together to create an impressive script, and visually captivating film. 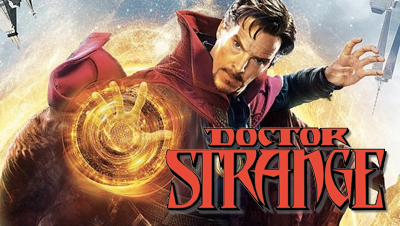 Marvel have pushed the franchise into a bold new direction with “Doctor Strange,” entering an exciting world of magic, villains, time, and space. So whatever the future of Marvel looks like, it’s going to be strange.